Anyone who has experienced Los Angeles gridlock likely can attest that traffic may cause one’s blood pressure to rise. But UC Irvine researchers have found that, beyond the aggravation caused by fellow drivers, traffic-related air pollution presents serious heart health risks — not just for rush hour commuters, but for those who live and work nearby. Research by UC Irvine joint M.D./Ph.D. 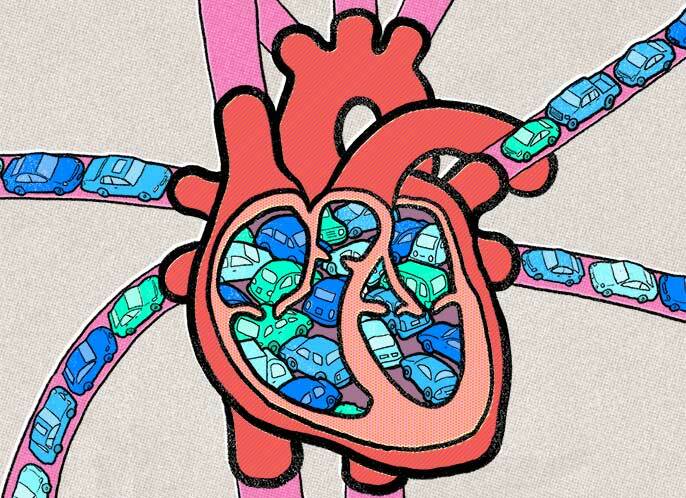 student Sharine Wittkopp contributes to evidence that the increased air pollution generated by vehicle congestion causes blood pressure to rise and arteries to inflame, increasing incidents of heart attack and stroke for people who reside near traffic-prone areas. “While the impact of traffic-related pollution on people with chronic lung diseases is well known, the link to adverse heart impacts has been less described,” said Wittkopp. Her research project, funded by the National Institute of Environmental Health Sciences, focused on residents of a Los Angeles senior housing community who had coronary artery disease. Study participants spend the vast majority of their time at home, which meant they had prolonged exposure to traffic-related air pollution at the site. Because of their age and preexisting heart conditions, they were thought to be more vulnerable to small, day-to-day variations in air quality. Up to now, most studies on the impacts of air pollution have focused on its effects over much larger populations, with difficulty capturing accurate exposures and short-term changes. Wittkopp and her team wanted to look at how daily fluctuations in traffic and air quality would affect those residing in the immediate vicinity of congested roadways. The research team, led by advisor Ralph Delfino, associate professor and vice chair for research and graduate studies in the Department of Epidemiology at UC Irvine’s School of Medicine, set up air quality monitors at the residences of the study participants. They looked for daily and weekly changes in traffic-related pollution such as nitrogen oxides, carbon monoxide, and particulate matter. What they found: “Blood pressure went up with increased traffic pollutants, and EKG changes showed decreased blood flow to the heart,” Wittkopp said.